The Marine Corps League Outer Banks Detachment has been granted the privilege as an official certifying organization for the President's Volunteer Service Award and is authorized to recognize volunteer service by groups and individuals per the criteria of the nationally accredited program. 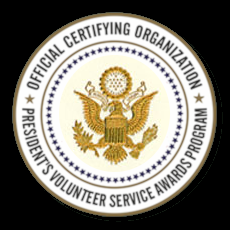 The President’s Volunteer Service Award was established by President George H. Bush in 2002 and recognizes United States citizens and lawfully admitted permanent residents of the United States who have achieved the requisite hours of service over a 12-month time period or cumulative hours over the course of a lifetime. Those selected to receive this honor are presented, at no cost, a congratulatory letter from the President of the United States, a personalized certificate, and an official pin, medallion or coin. Recipients must be a United States citizen or a lawfully admitted permanent resident of the United States. Awards are based on uncompensated volunteer service only. The Certifying Organization has the authority to determine the type of volunteer service that is creditable towards the award. Individual and group awards are issued for qualifying service hours performed within a 12-month time period or over the course of a lifetime. Hours are tabulated from 1 January through 31 December each year. Awards are offered in multiple levels and are designed to recognize each milestone of service achievement. See below chart for specific details. Individuals performing 4,000 or more hours of qualifying volunteer service, regardless of time period are eligible for a special Lifetime Achievement Award. Family and group awards are based on the number of creditable volunteer hours performed by a group or family of two or more persons during the prescribed 12-month period determining the award level. Those interested in participating in this program are encouraged to contact us for further details.